Each critical excercise builds upon the previous one, resulting in a strong foundation and consistent presence. 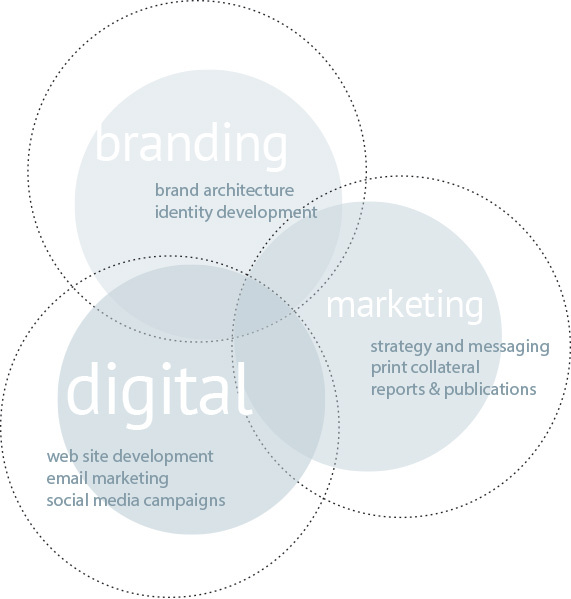 Working closely with our clients, we identify the most effective channels for messaging. Today’s world is producing ever increasing amounts of information, at an ever increasing rate. The average person/consumer/company is becoming overwhelmed by this ever increasing amount of data. It is the goal at Flockhart Design to attack these mounds of complex information and develop systems that organize and convey this information to a target audience as simply and straightforwardly as possible. To manage the information age Flockhart Design enlists two growing methods of design strategy—Design Planning and Strategic Communication. Design planning enables Flockhart Design to move beyond creating individual artifacts (annual reports, brochures, logos…), and function at a strategic level. Design planning can identify new products, services and messages that will, when implemented in a systematic way, transform an organization. It allows an organization to deliver dramatically improved value to its customers and can set a pace of innovation that can leave competitors standing in its dust. It fuses elements of business research, social observation and analytical methodology with design methods to create systems for new strategy and organizational change. Strategic communication is the integrated use of messages and images that span disciplines and departments of organizations. It necessarily strengthens the company’s brand and its reputation. It enlivens the company’s relations with key audiences and advances the company’s goals. Both methods require that a design team be as sharp on business issues as they are on style and communication technique. Flockhart Design has such a team. We are positioned to collaborate with our clients—bringing special skills, creative thinking and focused execution, to the task of developing effective materials. We have the ability to understand, interpret, and contribute to the expression of corporate strategy with the skills necessary to deliver quality. Our work embodies the spirit of successful solutions through partnering.